1980년 충주댐 건설로 인하여 충북 청원군에 있던 조선중기의 문신인 김위의 묘를 이장할 때 미이라 상태로 변화된 시신과 함께 발견된 의복들이다. 김위의 정확한 생존 년대는 알 수 없으나 임진왜란 당시 현감(縣監)을 지냈다고 하며 복식의 형태나 옷감의 무늬, 족보 등을 추정해 볼 때 출토된 복식들이 임진왜란 이후부터 17세기 초기의 것으로 판단된다. 출토된 의복에는 외국에 사신으로 파견될 때나 왕을 호위할 때, 국난이 있을 때 입었던 철릭과 지금의 두루마기 모습과 비슷하지만 옷깃이 직선으로 곧아 직령포라고 불리는 옷과, 옷깃이 둥글어 단령이라 불리는 옷 그리고 옷의 일부가 트여져 있는 창의, 여름에 입기 위해 삼베로 만든 저고리인 적삼, 한복 속에 입는 바지인 속곳과 솜버선 그밖에 시신을 덮었던 명주로 만든 천금 등으로 목록을 보면 다음과 같다. 이 옷들은 임진왜란때 현감을 지냈던 김위의 것으로 당시 의제를 잘 보여주고 있다. 특히 깃이 둥근 단령과 깃이 직선으로 각이 진 직령이 함께 출토되어 그 이전까지 불분명했던 의복의 표리관계가 확실히 밝혀졌다. 즉 평상시에는 직령이나 창의를 입고 있다가 관청에 출근 할 때 단령을 위해 걸쳐 입었던 것을 알 수 있다. 또한 직령은 겹으로 되어있고 단령은 홑겹으로 만들어졌으며 소매는 좁은 편으로 조선초의 전형적인 의습을 보여주고 있다. 임진왜란 당시의 유물들이 다량으로 출토되어 우리나라 복식연구에 귀중한 자료가 되고 있다. The various clothes were excavated along with a mummy from the grave of Kim Wi, who was a civil official during the mid-Joseon Dynasty when his tomb was relocated due to the construction of Chungju Dam in Cheongwon-gun, Chungcheongbuk-do in 1980. The exact date of the grave is not known; judging from the fact that he served as Governor during the Japanese invasion of Korea in 1592, and according to the style and pattern of the clothes, however, the clothes excavated from the grave seem to belong to the period between the Japanese Invasion and the early 17th century. 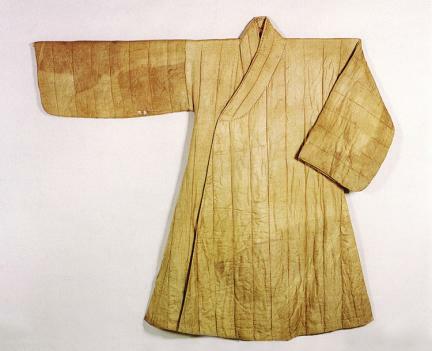 Among the excavated clothes are cheollik (official robe) worn by civil and military officials when they were sent to a foreign country as an envoy, when they escorted the King, or during a national crisis, Jingnyeongpo, which resembles durumagi (Korean topcoat) but has a straight collar, dallyeong (courtier’s ceremonial robe) with a round collar, changui (topcoat), which has a partial opening, jeoksam (an unlined summer jacket), which is made of hemp, sokgot (petticoat), cotton socks, and silk cheongeum, which was used to cover the body. The following artifacts were excavated: ① hemp jeoksam ② silk-lined jingnyeongpo ③ purple silk cheollik ④ cotton-padded sokgot ⑤ silk-padded sokgot ⑥ cotton quilted changui ⑦ brown-lined changui ⑧ cotton-padded socks ⑨ silk-lined changui ⑩ silk unlined cheollik ⑪ silk quilted changui ⑫ cotton-padded silk sokgot ⑬ silk-lined cheollik ⑭ silk jingnyeongpo ⑮ dallyeong (ceremonial robe). These clothes all belonged to Kim Wi, who served as Governor during the Japanese Invasion of Korea in 1592. They show very well the style of formal clothes at that time. In particular, dallyeongpo, whose collar is round, and jingnyeong whose collar is straight were found together. Thus, the excavation clearly shows the custom of dress, which was previously uncertain. In other words, jingnyeong or changui was worn in ordinary times, and dallyeong was worn over it during attendance at the office. In addition, jingnyeong has a lining, but dallyeong has none. The sleeves are relatively narrow, which is a typical style during the early Joseon period. The artifacts from the time of Imjin Waeran provide valuable information in studying the style of Korean clothes.